If you're a Dave Ramsey fan, then you are probably familiar with the Dave's phrase "relax in a place..." He uses this phrase to describe the feelings that people experience when they begin to get control of their finances. I've heard him say this phrase before on the radio as well as in Financial Peace University. I know from firsthand experience the peaceful, contented, relaxed feeling that flows out of a place inside your spirit (sorry, that sounded a bit Oprah-ish) when you finally get your money stuff together. Instead of worrying about your finances, you genuinely feel a sense of control, and I'm not talking about being a psycho, control-freak here, either. It's just a lot easier to live out life on a day-to-day basis when you're not worried if you're going to run out of money before you run out of month. When you finally start getting a handle on your financial situation, there are a number of areas in which you begin to relax. The first area I think of is making purchases and paying bills. I'm sure you've experienced times like I did in the past when I wondered if I had enough money in my checking account when I was in line at the grocery store paying for groceries with my debit card. Or, if I had enough money left in the account when I was writing checks to pay the utility bills. And, now with massive increases in fuel prices over the last few years, I'm sure a lot of people are standing at the pump, stressing out, wondering if they even have enough money in their accounts to cover the cost of gas for their cars! A second area for financial relaxation is giving, and as a believer in Christ, this really this should be the first area, shouldn't it? Once you have a grasp on your income and outgo and you have a working budget in place, it's a lot easier to tithe consistently and intentionally. Once I had a written out cash flow plan, I could clearly see that if I would simply plan my giving back to God at the very top of my budget spreadsheet, then I could figure out a way to make the rest of my budget work on the remaining money leftover. Instead of giving God my leftovers, I was giving Him the firstfruits, the very best of the money He had allowed me the privelege to manage for Him in the first place! A third area for financial relaxation would be advanced planning for emergencies and future purchases. When you have at least a baby emergency fund in the bank as well as a monthly plan in place, it's just a heck of a lot easier to roll with the punches and go with the flow when little unexpected emergencies or financial problems crop up from time to time. You can usually just deal with your problem without too much stress or difficulty and move forward with your life! 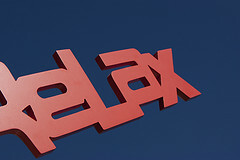 In my next post, Part 2, I will conclude with the process of relaxation. I will go through five areas in which you will need to work through in order to bring relaxation and financial peace into your life. Stay tuned!